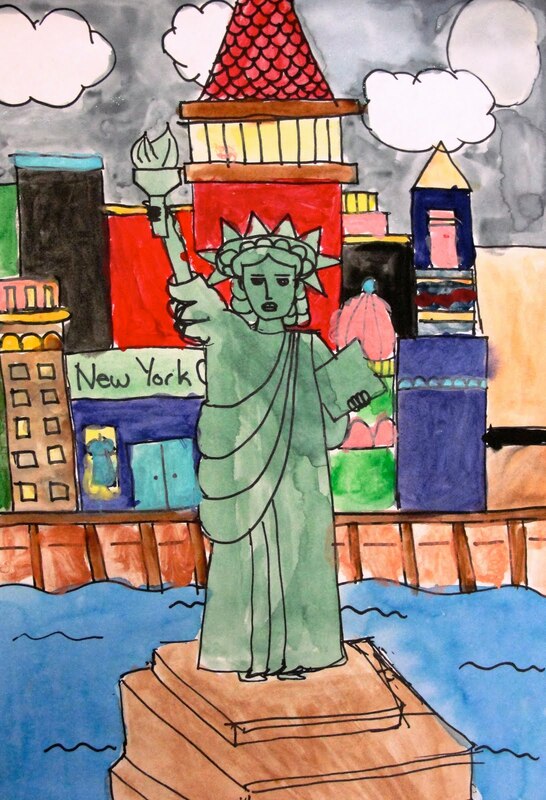 The Statue of Liberty is a great subject for teaching art techniques; watercolor, collage, tempera, marker...pick any medium and the project will turn out great. The drawing itself is quite simple, especially if you stick to the head and shoulders. You can read my basic instructions here. 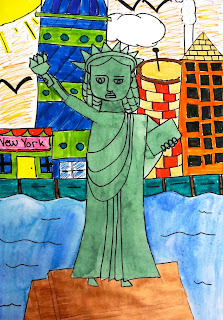 For this lesson, I panned out and asked my students to draw the entire length of the statue, complete with a city scene in the background. Optional: Embellishments such as paper scraps, sequins, etc. For this project, I decided against pencils and erasers. Fifth graders tend to be perfectionists and if given a pencil, will toil away for hours getting the draping just right. Of course, if you are doing this project at home and time is not a concern, go ahead, use a pencil. But in my opinion, learning to draw without an eraser is very rewarding. I often ask my students to draw with just a marker. In order for this to work, you need to do a little work yourself. 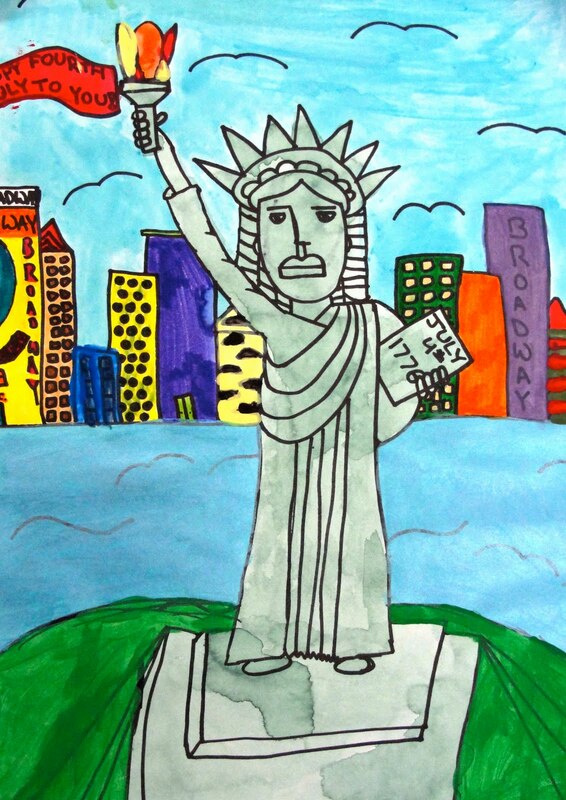 I demonstrate different ways to draw Lady Liberty on the white board. I use a marker (or course) and prove that if mistakes happen, they can be "fixed". 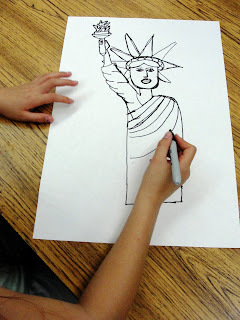 Try this yourself and make sure that not one of your finished Lady Liberty's are perfect. 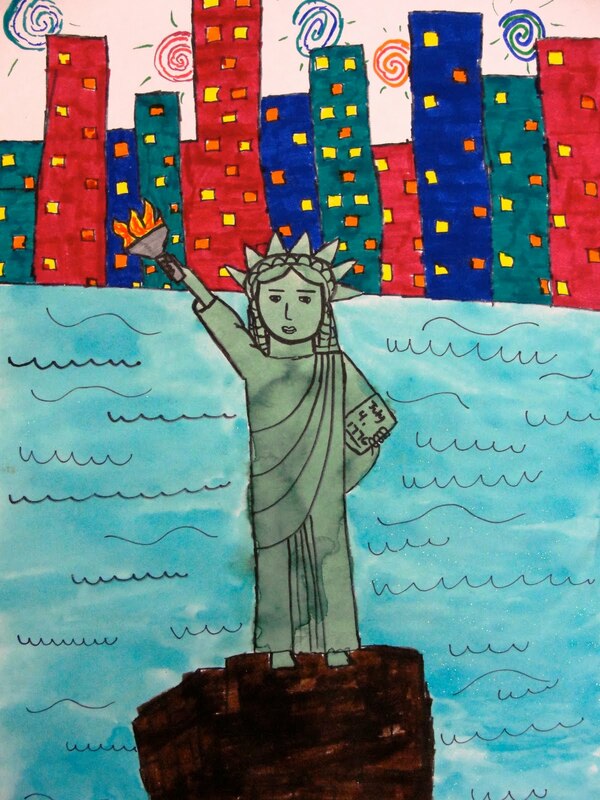 The drapes on the dress, the curls in the hair and points on the crown all yield well to mistakes, so really try to instill in your students that mistakes happen and you can still have great art. Remember to mention that if the kids run out of room, it's okay to go off the page. 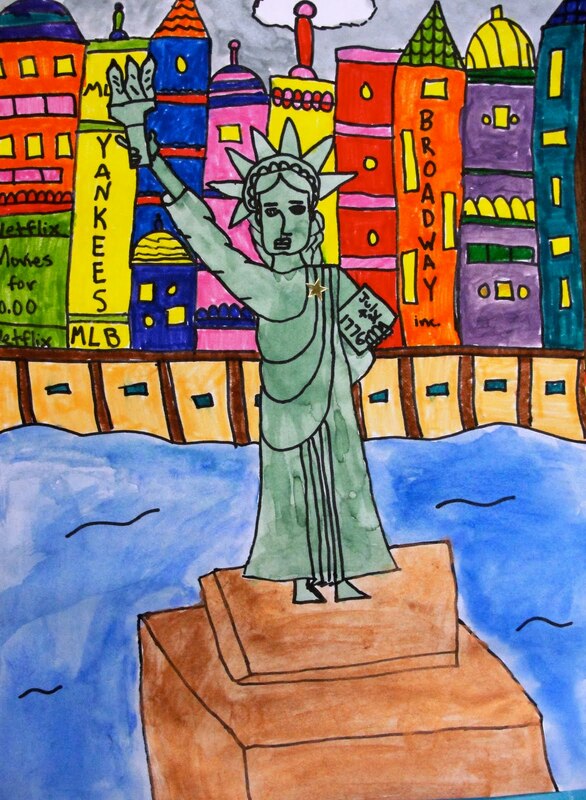 Once the students complete the drawing of Lady Liberty and the background, set out a limited palette of watercolor paints. I like to combine green and black liquid watercolors to achieve the patina of the statue. If you don't have liquid watercolors, use food coloring. It works great. 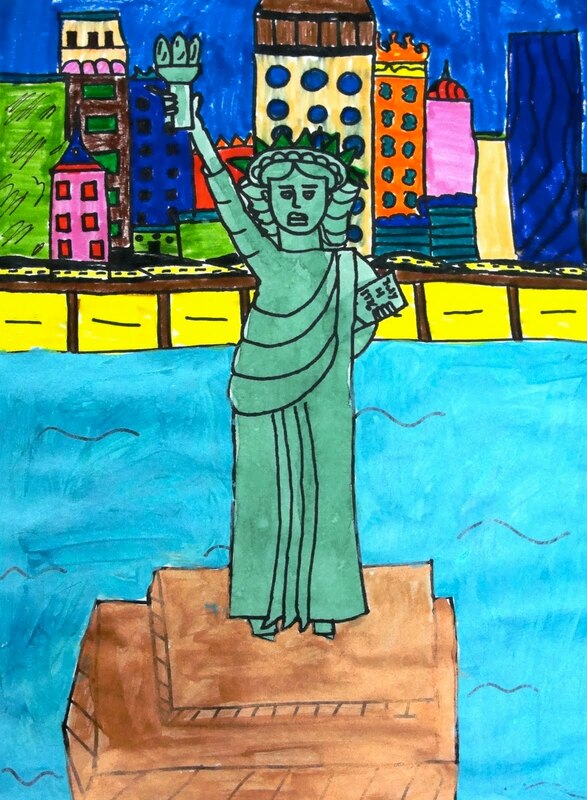 Suggest that the students consider painting the statue green (they don't have to paint it all) and the water and sky. Big spaces=watercolor. Little spaces=marker. Once the paint is dry, pull out the markers. If you are a teacher, finishing the watercolor will allow you to manage the completion of this project better. 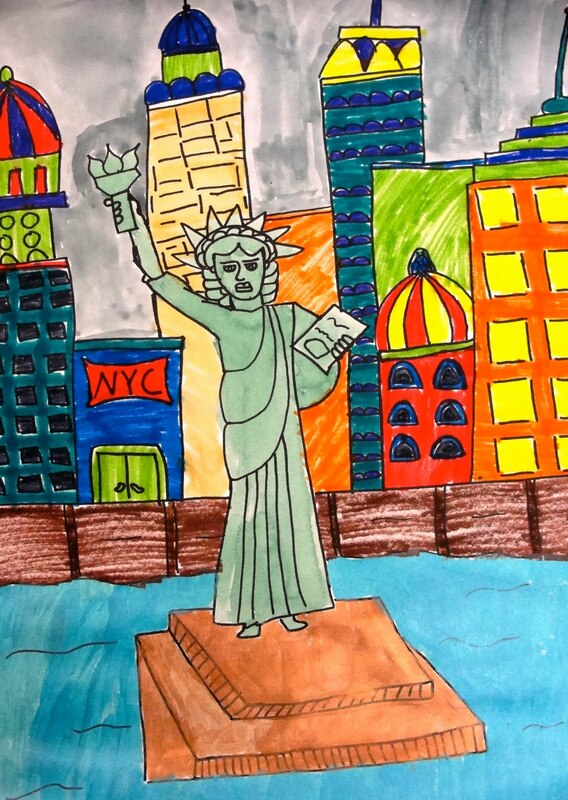 Students who have completed the drawing and watercolor parts, can return to this project anytime to finish the coloring. Pulling out markers is much easier than prepping watercolor paint. If you have any embellishments in your art closest, bring them out now. Some kids like to use sequins in the crown or skyscrapers. Since I have tons of painted paper scraps, I allow the students to access that as well. Some will chose to embellish, others won't. Hi! I just found your blog and have to say it is amazing! Thank you so much for sharing your wonderful talents with all of us fellow teachers out there and all the students whose lives I know you have touched! 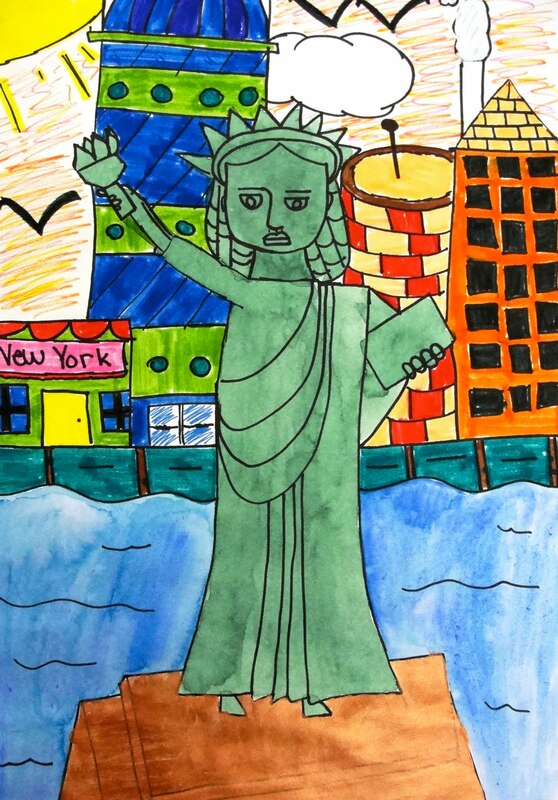 Being a regular elementary classroom teacher, who doesn't consider herself very good at art, I am excited to use your ideas in my regular classroom!! 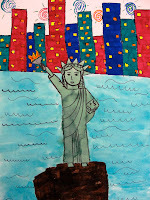 I am definitely going to use this Lady Liberty lesson and the space shuttle idea before this. these are so creative and dynamic too. I love this idea! My school does a huge art show for Veteran's Day, I think this would be a great project to display. I've noticed that you suggest liquid watercolor with your watercolor projects. I'm new to teaching and haven't experimented with liquid watercolor before. Your projects seem to be a lot brighter and more controlled than those I do with my students. What is the benefit vs. palette watercolors? Hi Patty, as usual, nice project. 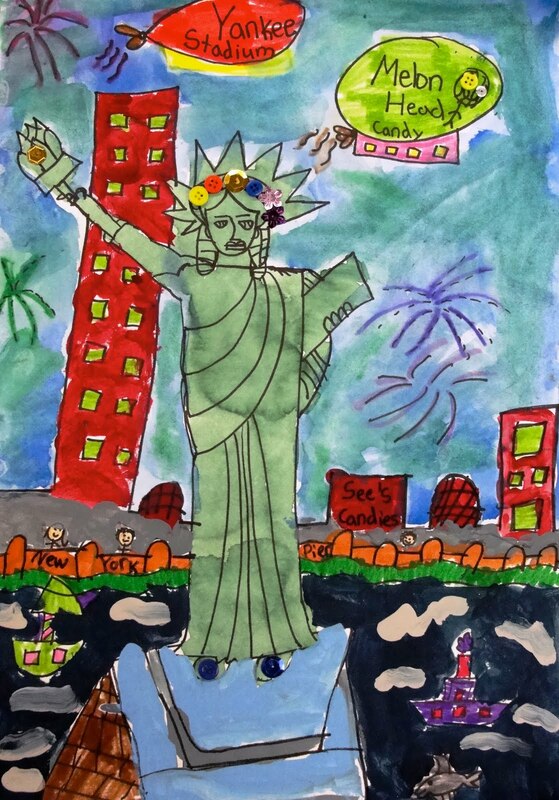 However, as a New Yorker who has seen Lady Liberty many times, I must note that her pedestal base is easily as tall as she is, and pedestal and all, she is ON AN ISLAND. She doesn't just rise from the sea! It would be very cool to include itty bitty people on the island to really accentuate how very tall she is. Me again, I just wanted to say I hope I haven't offended you! I didn't mean to, so I apologize. Thanks so much for listing me on your art links. I appreciate it! Thanks for the nice comments. Liquid watercolor might seem expensive, but a little really goes a long way. I love the vibrant colors and yes, I do think they are better than pan watercolors. Others might disagree but my experience favors liquid watercolors. My students love them as well. I would encourage you to buy a set and experiment with your students. I LOVE your blog! Great ideas, pictures, and very easy to navigate! You have inspired me to attempt my own blog on my art classes and I will definitly have to borrow some of your ideas! Thank you!